Washington, DC – January 28, 2013 - Unique testimony will be presented to Congress on February 5, 2013. For 217 days, one man has traveled over 30,000 miles to every state filming people who have been harmed by judicial corruption and government corruption. Upon compiling over 1,000 hours of video testimonials from over 750 ordinary citizens from all across the United States, the Lawless America project provides overwhelming evidence that the Constitution and laws written by the Legislative Branch are being disregarded by the Judicial Branch of government. This rampant disregard for the law and the fundamental rights of Americans is captured in the video testimonials from every state in the nation. On February 5, hundreds of victims and advocates have made appointments with their members of the House and Senate, and they will hand-deliver a DVD containing Congressional testimony from victims as well as proposed legislation to reform the legal system and the judiciary. Every member of Congress will receive the evidence from victims on February 5. Abbreviated video presentations are being offered of many horrendous cases that have devastated the lives of people by unlawful judicial proceedings and legal abuse. The intent is to show Congress what is occurring all across the country and why public Congressional hearings are needed to make the public aware and bring about the change required. The evidence is overwhelming. Blatant and often collusive abuses of power by these government officials to dictate outcomes of people’s lives unjustly, makes this a crisis situation. Measures implemented by the legislature to assure accountability within the Judicial Branch will curtail these travesties of justice. Congress, working together with the People, can restore a legitimate government that complies with the Constitution and assures a legal system that applies the Rules of Law. 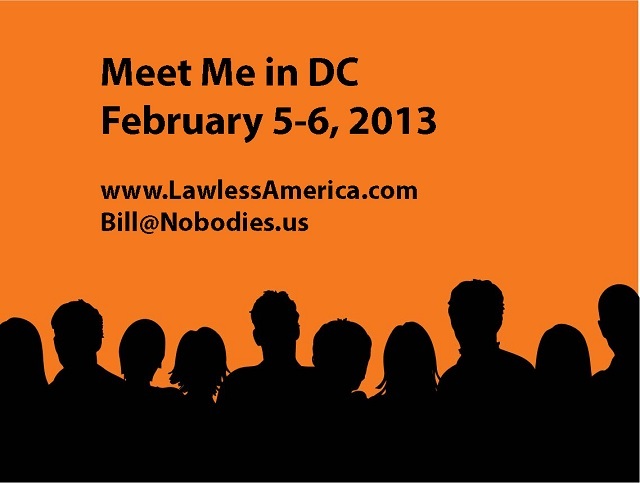 In addition to the personal meetings on February 5, Lawless America is holding a caucus in Washington, DC on February 6. Members of Congress are invited to attend sessions at the Rayburn Office Building, Room 2103 from 11 am to noon. Members of Congress, their staffs, and the media are invited for a large group presentation and question-and-answer session from 2 to 5 pm in the Ballroom at the Crowne Plaza National Airport Hotel, 1480 Crystal Drive, Arlington, Virginia. A documentary film titled Lawless America is being produced from the filming. It is scheduled to be released in January 2014. Discussions are also currently underway that could lead to a weekly Lawless America network television show. The movie asks: Can 750 Nobodies save America? That's the goal of the project. Lawless America will expose government corruption in America in a shocking expose. This will not be just a movie; this will be news; this is an effort to save America. The government has done everything possible to keep this story from being told, but Lawless America will expose the corruption for all to see. Our Constitutional rights are a mirage. There is no one in government who will stand up against the evil-doers. Judges all across America regularly commit criminal acts and damage people because they have the power to do it. Judges answer to no one. If you have ever questioned the story of a person who has expressed the view that they were a victim of the government or of judges, this movie will prove that the odds are that the report was true. The issues that motivated the colonists in America to revolt were NOTHING compared to the issues that all Americans face today. We have lost what our founding fathers established for us. We have lost our fundamental rights. But 99.99% of Americans do not even realize it. Educating a wide audience is essential if there is any hope that we can bring about reform. 750 nobodies and their families and friends have set out to save America. No guns, no violence, just a Jeep, cameras, microphones, and 750 everyday people telling their stories. If Congress acts true to form, they will ignore this testimony. The ball is now in their court. The members of Congress who fail to report the thousands of felonies that are presented in the testimony will be making it clear that they are part of the corruption and have no business representing the people. Bill Windsor and the Lawless America “Nobodies” pray that some brave members of Congress will take appropriate action. Congressional Testimony videos are posted on the Lawless America YouTube Channel, and pages for each person filmed for Lawless America are being posted at www.LawlessAmerica.com. Never before have citizens taken it upon themselves to travel and work with citizens in every state to gather testimony for Congress. But for 217 days, Bill Windsor and thousands of victims of government corruption and judicial corruption came together to do just that. If the House and Senate Judiciary Committees ignore this, they will firmly establish just how corrupt they are. If they meet with Bill Windsor and representatives of Lawless America and later schedule hearings, there is hope that someone somewhere might do the right thing and clean this up. The next question is: Will the mainstream media ignore this historic story? This News Release is being distributed. Lawless America's DC event is called "Meet Me in DC."